This article is about former city of Toronto in 1834–1997. For the city of Toronto in 1793–1834, see York, Upper Canada. For the neighbourhood in Toronto, see Old Town, Toronto. Old Toronto is the retronym of the area contained within the original boundaries of Toronto, Ontario, Canada, from 1834 to 1998. It was first incorporated as a city in 1834, after being known as the town of York, and became part of York County. In 1954, it became the administrative headquarters for the Municipality of Metropolitan Toronto. The city expanded in size by annexation of surrounding municipalities, reaching its final boundaries in 1967. Finally, in 1998, it was amalgamated with the other cities of Metropolitan Toronto (York, North York, Etobicoke, Scarborough); and the borough of East York, into the present-day city of Toronto. This was not a traditional annexation of the surrounding municipalities (where a city absorbs the said municipalities but officially remains the same city), but rather a new municipal entity that is the successor of the original city. Historically, "Old Toronto" referred to Toronto's boundaries before the Great Toronto Fire of 1904, when much of city's development was to the east of Yonge Street. Since the amalgamation, the former city is variously referred to as the "former city of Toronto" or "Old Toronto." It is sometimes referred to as "downtown" (Downtown Toronto is located within Old Toronto) or as "the core." Old Toronto has a population density of approximately 8,210 people per square kilometre, which would rank it as the densest in Canada (third-densest in North America) among cities with a population over 250,000 if it were still a separate city. Residents celebrate the incorporation of York into the City of Toronto in 1834. The former town of York was incorporated on March 6, 1834, reverting to the name Toronto to distinguish it from New York City, as well as about a dozen other localities named "York" in the province (including the county in which Toronto was situated), and to dissociate itself from the negative connotation of "dirty Little York", a common nickname for the town by its residents. The population was recorded in June 1834 at 9,252. In 1834, Toronto was incorporated with the boundaries of Bathurst Street to the west, 400 yards north of Lot (today's Queen) Street to the north, and Parliament Street to the east. Outside this formal boundary were the "liberties", land pre-destined to be used for new wards. These boundaries were today's Dufferin Street to the west, Bloor Street to the north, and the Don River to the east, with a section along the lakeshore east of the Don and south of today's Queen Street to the approximate location of today's Maclean Street. The liberties formally became part of the city in 1859 and the wards were remapped. William Lyon Mackenzie, a Reformer, was Toronto's first mayor, a position he only held for one year, losing to Tory Robert Baldwin Sullivan in 1835. Sullivan was replaced by Dr. Thomas David Morrison in 1836. Another Tory, George Gurnett, was elected in 1837. That year, Toronto was the site of the key events of the Upper Canada Rebellion. Mackenzie would eventually lead an assault on Montgomery's Tavern, beginning the Upper Canada Rebellion. The attacks were ineffectual, as British regulars, and the Canadian militia in Toronto went out to the rebel camp at Montgomery's Tavern and dispersed the rebels. Mackenzie and other Reformers escaped to the United States, while some rebel leaders, such as Samuel Lount and Peter Matthews, were hanged. Toronto would elect a succession of Tory or Conservative mayors, and it was not until the 1850s that a Reform member would be mayor again. Shortly after the rebellion, Toronto was ravaged by its first great fire in 1849. The fire was one of two great fires to occur in the city, with the other occurring in 1904. In their efforts to control the city and its citizens, the Tories were willing to turn to extra-governmental tools of social control, such as the Orange Order in Canada. As historian Gregory Kealey concluded, "Following the delegitimation of Reform after the Rebellions were suppressed, the Corporation (of Toronto) developed into an impenetrable bastion of Orange-Tory strength." By 1844, six of Toronto's ten aldermen were Orangemen, and over the rest of the 19th century, twenty of twenty-three mayors would be as well. A parliamentary committee reporting on the 1841 Orange Riot in Toronto concluded that the powers granted the Corporation made it ripe for Orange abuse. Orange influence dominated the emerging police force, giving it a "monopoly of legal violence, and the power to choose when to enforce the law." Orange Order violence at elections and other political meetings was a staple of the period. Between 1839 and 1866, the Orange Order was involved in 29 riots in Toronto, of which 16 had direct political inspiration. At its height in 1942, 16 of the 23 members of city council were members of the Orange Order. Every mayor of Toronto in the first half of the 20th century was an Orangeman. This continued until the 1954 election when the Jewish Nathan Phillips defeated radical Orange leader Leslie Howard Saunders. The boundaries of Toronto remained unchanged into the 1880s. Toronto expanded into the west by annexing the Town of Brockton in 1884, the Town of Parkdale in 1889, and properties west to Swansea (such as High Park) by 1893. In the 1880s, Toronto expanded to the north, annexing Yorkville in 1883, The Annex in 1887, and Seaton Village in 1888. In the 1900s, Toronto expanded again to the north, annexing Rosedale in 1905, Deer Park in 1908, the City of West Toronto, Bracondale, and Wychwood Park in 1909, Dovercourt Park and Earlscourt in 1910, and Moore Park and North Toronto in 1912. To the east, Toronto annexed Riverdale in 1884, a strip east of Greenwood in 1890, Town of East Toronto (including East Danforth and Upper Beaches) in 1908, an extension east to Victoria Park Avenue in 1909, and the Midway (bounded by Danforth Avenue in north, Greenwood Avenue to west, Queen Street to south and East Toronto western boundaries to the east) in 1909. By 1908, the named wards were abolished, replaced by a simple numbering scheme of Ward 1 to Ward 6. By the 1920s, Toronto stopped annexing suburbs. In 1954, the municipalities in York County south of Steeles Avenue were severed from the county to form the new regional Municipality of Metropolitan Toronto, which included Toronto and numerous suburbs. Metropolitan Toronto operated as an upper-tier municipal government whereas Toronto continued to operate as a lower-tier government within Metropolitan Toronto. In 1967, provincial reform of lower-tier municipalities in Metropolitan Toronto saw Toronto annex the municipalities of Forest Hill, and Swansea. The City of Toronto remained this size until 1998, when it was formally dissolved, with its area amalgamated into the new City of Toronto. The new City of Toronto was formed from Old Toronto, and five other dissolved municipalities that made up Metropolitan Toronto in 1997. The Horticulture Building, used for the Canadian National Exhibition. The building was built in 1907 to replace the Exhibition's second Crystal Palace. The first Crystal Palace in Toronto, officially named the Palace of Industry, was modelled after the Crystal Palace in Hyde Park, London, England, and it was Toronto's first permanent exhibition hall. Completed in 1858, it was located south of the Provincial Lunatic Asylum, northwest of King and Shaw Streets. It was dismantled in 1878, and the ironwork was used to construct a new Crystal Palace on what would later become Exhibition Place. The second Crystal Palace hosted Toronto's first Industrial Exhibition (the predecessor to the Canadian National Exhibition (CNE)) in 1879. By the time it was destroyed in 1906 by fire, it was officially known as the CNE Transportation Building. It was replaced by the Horticulture Building in 1907. Bridgepoint Active Healthcare is one of several health care institutions in Old Toronto. The institution presently includes the former Don Jail building. Old Toronto was home to a number of hospitals, including Bridgepoint Active Healthcare (originally named House of Refuge), Casey House, Mount Sinai Hospital, Princess Margaret Cancer Centre (originally named Princess Margaret Hospital), St. Joseph's Health Centre, St. Michael's Hospital, The Hospital for Sick Children, Toronto Grace Health Centre, Toronto Western Hospital, Women's College Hospital, . Two health care institutions were established after the 1998 amalgamation of the present City of Toronto, the Toronto Rehabilitation Institute, and the Centre for Addiction and Mental Health. The Toronto General Hospital is the oldest operating hospital established in Toronto. It started as a small shed in the old town and was used as a military hospital during the War of 1812, after which it was founded as a permanent institution, York General Hospital, in 1829, at John and King Streets. In 1853–56, a new home for the hospital was built on the north side of Gerrard Street, east of Parliament, using a design by architect William Hay, and relocated to University Avenue at College Street in 1913. The House of Providence on Power Street (between King and Queen Streets) was opened by the Sisters of St. Joseph in 1857 to aid the plight of the desperately poor. It was demolished in 1962 to make way for the Richmond Street exit from the Don Valley Parkway. By that time it was a nursing home, and its residents moved to a new facility at St. Clair and Warden Avenues, known today as Providence Healthcare. The House of Refuge was built in 1860 as a home for "vagrants, the dissolute, and for idiots." The building became a smallpox hospital during an epidemic during the 1870s. It was demolished in 1894, and a new structure called the Riverdale Isolation Hospital was built on the site in 1904, which evolved into the Rivderdale Hospital and later Bridgepoint Health. The Toronto Mechanics' Institute in 1884. The institute, whose collection was later absorbed by the Toronto Public Library in 1884, was established in 1830. Toronto has operated the Toronto Public Library system since 1884. Its collection originated from The Mechanics Institute, which was founded in 1830 by reform Alderman James Lesslie to provide technical and adult education. In 1853 the Institute erected a new permanent home at the corner of Church and Adelaide Streets, but it struggled to attract new paying members. In 1883 the Institute was thus transformed into a municipally supported public reference library. The idea was promoted by alderman John Hallam, but it met considerable resistance in city council. No other city in Canada at this time had a completely free public library. Hallam brought the initiative to a public referendum, and the citizens of Toronto voted in its favour on January 1, 1883. The 5,000-book collection of the Mechanics' Institute became the first books of the newly formed Toronto Public Library. As a result of the 1998 amalgamation of Toronto, the other municipal libraries of Metropolitan Toronto were merged with Toronto Public Library. It also merged with the Metro Toronto Public Library, which operated one branch, the Toronto Reference Library in Old Toronto. Built in 1893, the Ontario Legislative Building houses the Legislative Assembly of Ontario. The first Upper Canada parliament buildings were built in 1796 at Front and Parliament Streets when the capital of the Province was moved from Niagara-on-the-Lake. These were destroyed in 1813 during an attack on the then-City of York during the War of 1812. A second building was constructed on the same site in 1820, only to be lost to fire in 1824. They were replaced by a new structure built between 1829 and 1832 near Front, John, Simcoe, and Wellington Streets, which saw alterations took place in 1849. With the unification of Upper and Lower Canada in 1840, the building continued to see sporadic periods of usage as the legislature of the Province of Canada until the capital was permanently moved to what is now Ottawa shortly prior to Confederation in 1867, which saw the formation of the modern-day province of Ontario. Upon Confederation, Toronto was selected to be the provincial capital and thus the Front Street building returned to usage as the location of the provincial legislature until the current Legislative Buildings at Queen's Park were completed in 1893. The Front Street building remained vacant until it was demolished in 1903; the Canadian Broadcasting Centre now sits on the site. Chorley Park, located in the Rosedale neighbourhood, served as the official residence of the Lieutenant-Governor of Ontario from 1915 to 1937. The building was demolished in 1961 after it and the lands around it were purchased by the municipal government. 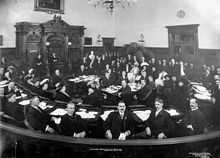 Meeting of the Toronto City Council in January 1911. In 1833, several prominent reformers had petitioned the House of Assembly to have the town incorporated, which would also have made the position of magistrate elective. The Tory-controlled House struggled to find a means of creating a legitimate electoral system that might nonetheless minimize the chances of reformers being elected. The bill passed on March 6, 1834 and proposed two different property qualifications for voting. There was a higher qualification for the election of aldermen (who would also serve as magistrates) and a lower one for common councillors. Two aldermen and two councilmen would be elected from each city ward. This relatively broad electorate was offset by a much higher qualification for election to office, which essentially limited election to the wealthy, much like the old Courts of Quarter Sessions it replaced. The mayor was elected by the aldermen from among their number, and a clear barrier was erected between those of property who served as full magistrates and the rest. Only 230 of the city's 2,929 adult men met this stringent property qualification. Toronto City Hall (left) next to Old City Hall (right). The latter building was used from 1899 to 1965, whereas the former has been used since 1965. The second market building replaced the original wooden market building in 1831 and ran from King Street to Front Street (the site of the current St. Lawrence Hall, and the St. Lawrence Market North building). It was selected by the first mayor, William Lyon Mackenzie, as city hall. His newspaper, the Colonial Advocate, rented space in the rear. This building, along with much of the surrounding Market Block, was destroyed by fire in the 1849 Cathedral Fire. The site was rebuilt as St. Lawrence Hall in 1850. The second city hall, built in 1845 and renovated in 1850, was known as the New Market House. It served as city hall until 1899. In 1904, the current St. Lawrence Market South building was built, incorporating part of the city hall structure. Toronto third city hall began construction in 1889, and was completed a decade later, in 1899. Old City Hall was also used as a court house (assuming the role of the closed Adelaide Street Court House, closed in 1900), and continues to be used as a dedicated court house. The third city hall was used by the Toronto City Council from 1899 to 1965, when they moved to the completed fourth Toronto City Hall. The earliest Toronto neighbourhoods were the five municipal wards that the city was split into in 1834. The wards were named for the patron saints of the four nations of the British Isles (St. George, St. Andrew, St. Patrick, and St. David) and St. Lawrence, a patron saint of Canada (St. Joseph is the principal patron saint of Canada). Today, only St. Lawrence remains a well-known neighbourhood name. The others have attached their names to a variety of still-existing landmarks, including three subway stations. As Toronto grew, more wards were created, still named after prominent saints. St. James Ward is preserved in the modern St. James Town neighbourhood, while the northern ward of St. Paul's has continued to the present as a federal and provincial electoral district. The population of Old Toronto was 736,775 at the 2011 census, living on a land area of 97.15 km² (37.51 sq mi). According to the 2001 census, the population was 70% Caucasian, 10% Chinese, 5% African-Canadian, 5% South Asian, 3% Filipino, 2% Latin American, 2% Southeast Asian, 1% Korean, and 2% Other. Careless, J. M. S. (1984). Toronto to 1918. James Lorimer & Company. ISBN 0-88862-665-7. ^ Firth, Edith G., ed. (1966). The Town of York: 1815—1834; A Further Collection of Documents of Early Toronto. University of Toronto Press. pp. 297–298. ^ Gregory S. Kealey (1984). Victor L. Russell, ed. Forging the consensus: historical essays on Toronto. Toronto. p. 45. ^ Gregory S. Kealey (1984). Victor L. Russell, ed. Forging the consensus: historical essays on Toronto. Toronto. p. 50. ^ Gregory S. Kealey (1984). Victor L. Russell, ed. Forging the consensus: historical essays on Toronto. Toronto. p. 42. ^ Walden, Keith (1997). Becoming Modern in Toronto: The Industrial Exhibition and the Shaping of Late Victorian Culture. Toronto: University of Toronto Press. ^ Arthur, Eric (2003). Toronto: NO Mean City. Toronto: University of Toronto Press. p. 114. ^ Robertson, John Ross (1894). Landmarks of Toronto Vol. 1. Toronto: J. Ross Robertson. pp. 398–9. ^ Firth, Edith (1966). The town of York, 1815–1834: a further collection of documents of early Toronto. Toronto: Champlain Society. pp. lxviii–lxix. ^ "2001 Community profiles". Statistics Canada. Retrieved April 15, 2010. Henry Scadding, "Toronto of old: collections and recollections illustrative of the early settlement and social life of the capital of Ontario" (Toronto: Adams, Stevenson & Co., 1873). An Act To extend the limits of the Town of York; to erect the said Town into a City; and to incorporate it under the name of the City of Toronto. Italics indicate neighbourhoods now defunct. For information on the evolution of each neighbourhood in general, see History of neighbourhoods in Toronto. This page was last edited on 25 March 2019, at 08:44 (UTC).